When the plains Indians were moving from place to place, they carried their clothing, valuables, tools, etc. in a parfleche, which was made from dried buffalo hide and decorated with brightly colored geometric designs. The parfleche was used by the Indian as we would use a suitcase. A great informational handout on the Plains Indian Parfleche can be found at http://history.nd.gov/activities/parfleche.pdf . You can print off the two sheets which give information about the parfleche and directions on how to make one from felt and using acrylic or tempera paints. Instead of the felt, we used brown grocery bag paper as the rawhide and colored our geometric designs with markers. We used the measurements and the cutting directions from the handout. Directions for our method, “American Indian Parfleche,” can be found in the 3rd Grade Projects Gallery in the sidebar. 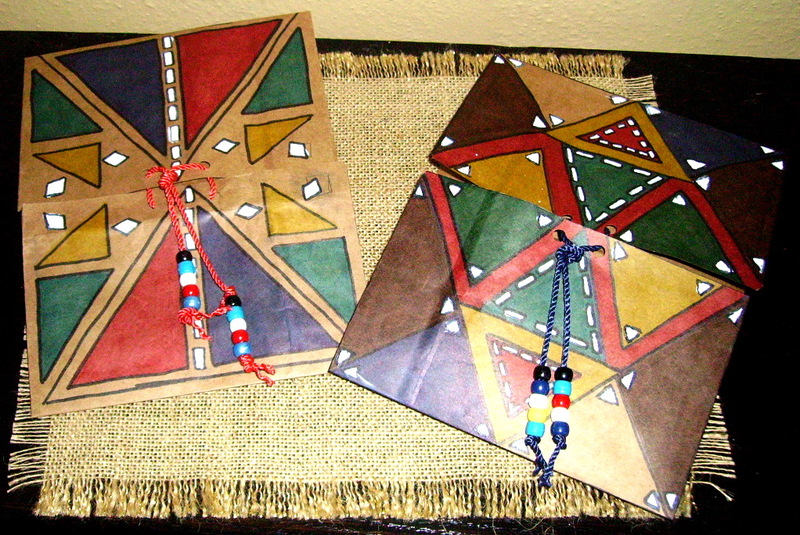 This entry was posted in 3rd Grade and tagged 3rd Grade, american indian parfleche, arts and crafts for kids, brown bag art projects, brown grocery bag, Indian, indian crafts for kids, indian parfleche craft, indian symbols, parfleche. Bookmark the permalink.